…the Stockade includes a detachable shoulder stock that holds a full 10 rounds—the exact number needed for a complete reload. As with their real-life SMG (submachine gun)-style counterparts, the Stockade does not necessarily make a name for itself in either distance or accuracy. We averaged ranges around 43 feet flat, and up to 56 feet with a 20-30 degree arc. This is a good bit better than the original Blockade, but still only average among others in the Elite line (and nowhere near Hasbro’s inflated “up to 75 feet” claims). 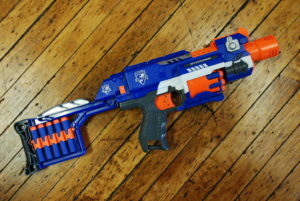 However, it is right in line with other flywheel-based blasters, including the Stryfe, which is one of our favorites. In addition, the overall accuracy of the Stockade is quite respectable, with shots typically landing within mere inches of each other… apart from the occasional spastic flight pattern that sometimes just seems to happen with Elite darts, that is. And like the Stryfe, the Stockade is a champ in terms of shots-per-second. 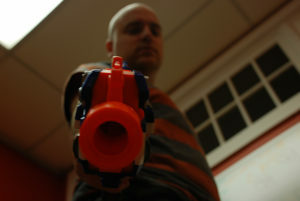 As fast as you can pull the trigger, that’s how fast you’ll get another shot. Of course, rapid fire does diminish overall distances since the flywheel needs spin-up time, but that’s a known deficiency with flywheel-based blasters, in general. General performance notwithstanding, our particular Stockade had one aspect that diminished it’s overall enjoyability, particularly versus it’s cousin, the Stryfe. Our Stockade had a rather nasty, somewhat off-balance sounding flywheel that vibrated the entire blaster, particularly the ammo chamber. It didn’t seem to inhibit performance that we could tell, but it was rather off-putting, and makes us wonder if there are perhaps more quality-control issues with flywheel-based blasters than with standard types. And while we’re griping, we have to say that we’re disappointed the new Stockade still has a thumb-mounted on/off switch for the flywheel. The “acceleration trigger” found on most new Elite and Vortex models is far easier to locate in the heat of battle, and doesn’t require the user to remember to turn the unit off when not firing. It may seem trivial, but that extra degree of control really becomes noticeable once you’ve used a blaster like the Stryfe, or even the Vortex Diatron, and does diminish our desire to make it a go-to blaster. Still, we like the Stockade’s tough, compact look, and we absolutely love the shoulder stock. We also like being able to load a single dart or two on the fly (versus have to load-up an ammo clip). 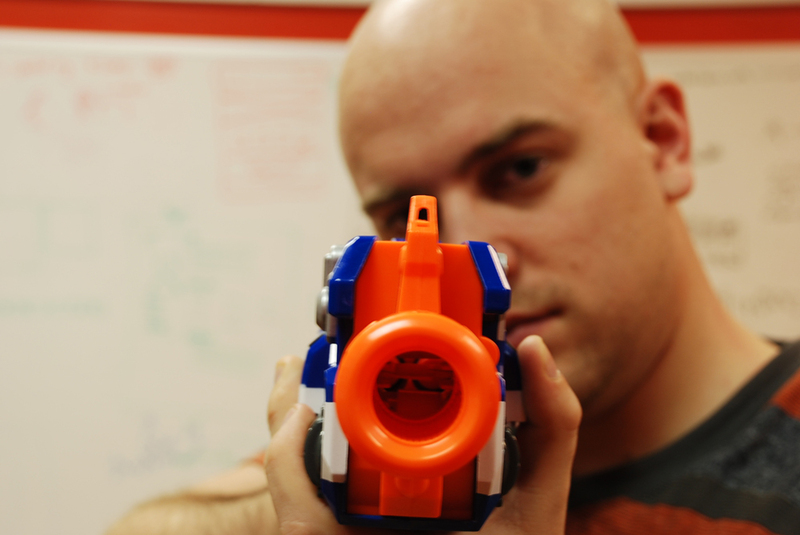 It’s a mean-looking blaster that we’re happy to have in our arsenal. It’s a pity, then, that the flywheel has the shakes, the flywheel trigger is still inconveniently located, and the overall performance isn’t any better. Otherwise, it’s a really fun blaster that should have come stateside a lot sooner.